I can't wait to have this over and done, though it terrifies me so to face another Cath, especially since Ava seems to be in a "Surprise and terrify the holy crap out of my parents" kick, it is needed. And just short of a Heart Cath worst case scenario(*knock, knock*), another cath beats out a third Open Heart Surgery. Blows it out of the water. So, as always, I ask all my loverly family and friends, to send the happy&healthy thoughts, vibes, prayers and chants(Hi Luci! :) Ava's way! So we met Ava's first teacher, super nice lady. And saw a friendly familiar face from the school where Ava will be attending this fall, which was definitely nice and helped calm my nervous overprotective mama nerves a bit. Just a bit though, let's not get carried away. I stayed and observed the class for a bit, only left because my lil missy kept turning in her seat to wave at me, when she was in her seat at all. 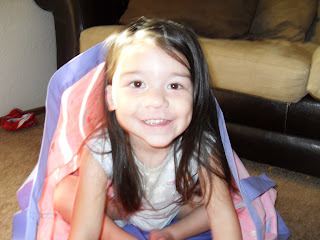 Other times she was running over to me to wave and give hugs, trying to drag her chair from the front of the classroom to the very back where I was sitting, etc. So as much as I didn't want to move a muscle until 12:00, I got myself up and said my goodbyes during a bathroom break(still no tears on her end, sigh) and went home. Where I texted with my two besties, looked at the clock every 22minutes, and uploaded photos off my phone and camera of the Diva until it was time to head back to pick her up. I got there a bit early, no surprise eh, and caught the end of lunch time. Seeing her sitting at a desk, eating all by herself without Mommy's help, she looked so grown. 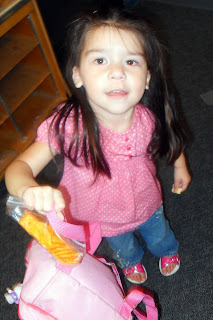 :) The teachers told me she had a fabulous first day of preschool, awww. Atta girl! 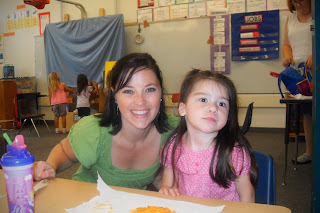 Ava with her teacher on the first day of school. Ava is well versed in the game of SURPRISE !!! 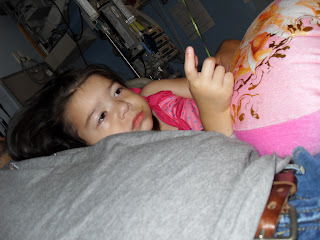 This photo was taken the day before Ava's last Catheter. So yesterday, June 1st, we reported to the UCD Cath Lab at 7am(yeah, late, really late, but still on time, gotta love it), for the Cath we have been waiting/planning/praying for and worrying over for pretty much this entire year. They started the procedure at approximately 9am with a 3-4 time frame put on how long it would take from the time we left Ava's side to the time Dr. would come talk to us, after everything was over. We did not see the Dr. until 2:30. A bit worrisome, but I tried to not let my mind run rampant with "what if's". So Dr. Van Gundy takes a seat and tells us first and foremost that Ava is fine, and he is sorry we had to wait so long to hear anything. Even he knows I am a total worry wart. :P Then goes into explanation of what happened. He placed the left PA stent...and it was pushed out by the pressures and kinda started floating off further into her pulmonary artery. So he quickly retrieved the wandering lost stent, and then placed it in her right PA, where the pressures are even higher...But he was confident with where he placed it. Though confident, he needed to observe it for 24 hours to make sure it also didn't become dislodged. And more importantly, we needed to keep Ava fully sedated/paralyzed so that she wouldn't be coughing/moving around and help dislodge it. So then I ask him where exactly that leaves us with her STILL unstented, unballooned narrow left PA. The answer, of course, Surgery. Going in surgically will allow them to use a bigger stent than they can via cath, which gives it a better chance of "sticking". Why did I ask. Especially when deep down I KNEW. So to the East 7 PICU we went. A very familiar place, even almost 3 years later. Anyhow. It's funny, absolutely everything about that place came back so sudden. Everything. 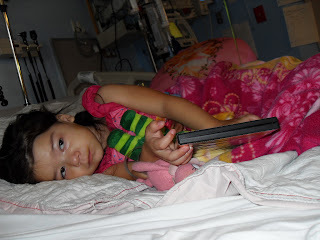 From where to throw the dirty linens, to where to find clean linens, to the ice machine, to a few of the nurses we really liked, to very specific moments and memories of Ava from when she was first there, the good and the bad. I was remembering it all. To be perfectly honest, that place still scares the holy crap out of me, and makes me on the verge of a full blown panic attack nervous, even when nothing is really going on, but I doubt that will ever change. 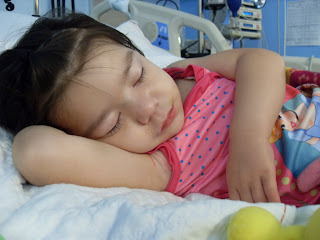 Ava stayed fully sedated and paralyzed(though she kept fighting through the sedation and waking up, which had to be terrifying for her considering she couldn't move or open her eyes, but talking to her and hugs, as well as extra versed, helped) the first night, as well as intubated, of course. The night was pretty uneventful, an Ava/UCD first! 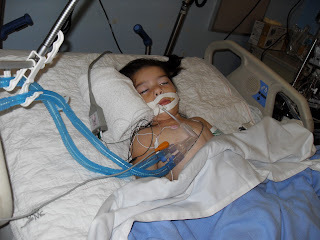 This morning we started slowly weening meds and the breathing machine. That went perfectly fine. Then out came the lines in her leg from the cath(they kept the catheter in in case they needed immediate access because of a dislodged stent, and there was also an art line. Both were in her left groin) Then came the food. Then came keeping the leg still-ish and resting for 4-5hours of observation. Then came HOME!!! Ava fell asleep on the way home, and is now in bed. Baby girl did so good the last two days! So where we are at now is tomorrow all the Dr's and Surgeons will do the teleconference deal and discuss Ava's case and what our next step will be, undoubtedly an OHS. We have a followup with cardio in a week, but he always calls us the day of the meeting to let us know what is going on. I will update when I know more. Thank you for all the thoughts and prayers, keep them coming!